So glad that you have all come for a visit. I have been steadily been busy doing some small projects around my little nest. I have really enjoyed decorating with shutters, doors, and windows. Especially those that have a great chippy patina. 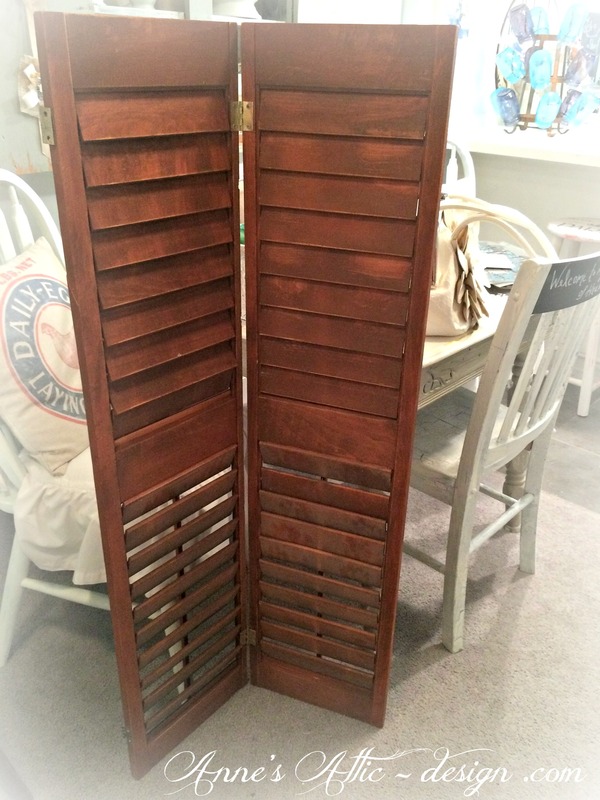 If I can’t find the patina that I love on these items then I create it myself, and this is just what I did with these shutters that I showed you in a post a while back. Here is a before picture of the two shutters that I created a new patina on. Here is the after pictures. I couldn’t have ask for a better crackle and chippy look. Here is the other side of the wall vignette. I had a shelf that my son Nathan built for me many moons ago and it was perfect to go on top of my vintage screen that is lined with a lace curtain. I have not liked anything that I have put up on this wall for the past 2 1/2 years and I finally feel like I have finally got it like I want , other than I am looking for a new picture to go into the antique frame. I have an idea of what I am going to do with it so I’ll be showing you that soon. A picture with the entire wall. 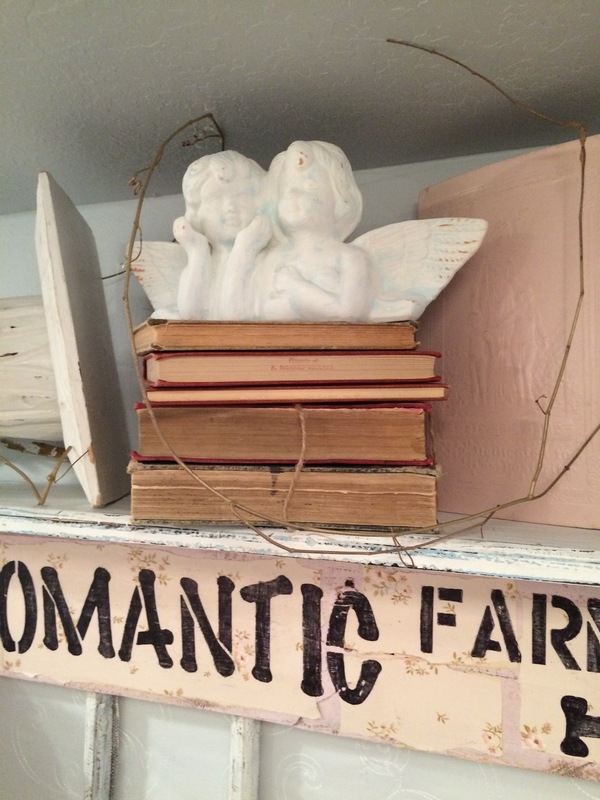 A couple of terracotta angels that I painted white top off the vintage books. I love using old architecture as well, see the white book ends on each side. 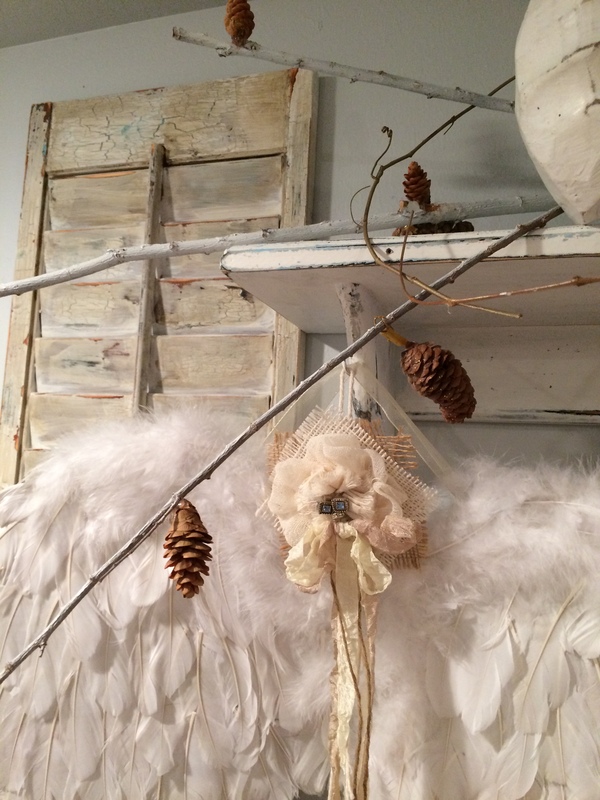 A Joey flower with angel wings, sticks and pine cones add to the effect for texture. 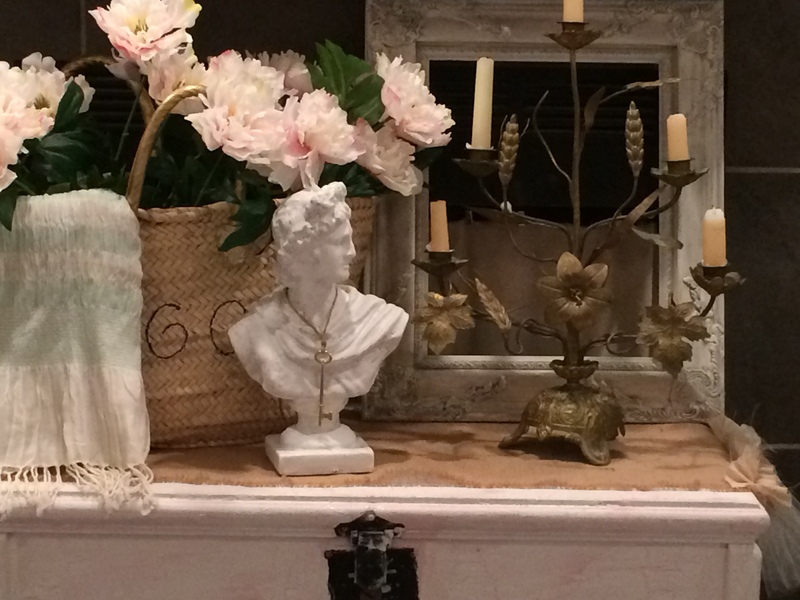 Here is a sweet vignette that I made up with a Roman bust, antique alter candle stick, a little burlap and basket of flowers on a chippy old chest. (I get the candle stick holder in 2 weeks)!!!!! 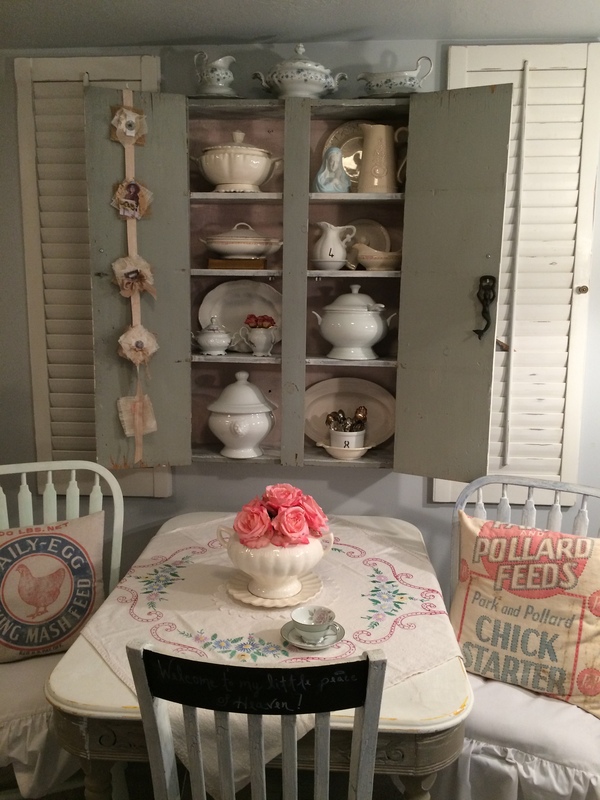 I had two large white shutters that I used on each side of my primitive cupboard. It seems to finish off the wall. Well that’s it for now. I hope that you all enjoy a lovely summer weekend where ever you are in this beautiful world. We are celebrating Pioneer Day in Utah on the 24th, so that should be fun. Until next time. This entry was posted in Anne's Attic - design, Antiques, Display, DIY, Painting, Painting Furniture, Refinishing Furniture, Shutters, Vignettes, White Decor and tagged Angel Wings, Angels, Anne's Attic - Design .com, Antiques, Architectural Decorating, Farmhouse Design, French Nordic Design, Prairie Design, Romantic Farmhouse, Shabby Chic, Shutters, Using Books in Vignettes, Vignettes by Anne's Attic - design. Bookmark the permalink. You achieved a beautiful chippy patina on the shutters-will you be posting how you did it? 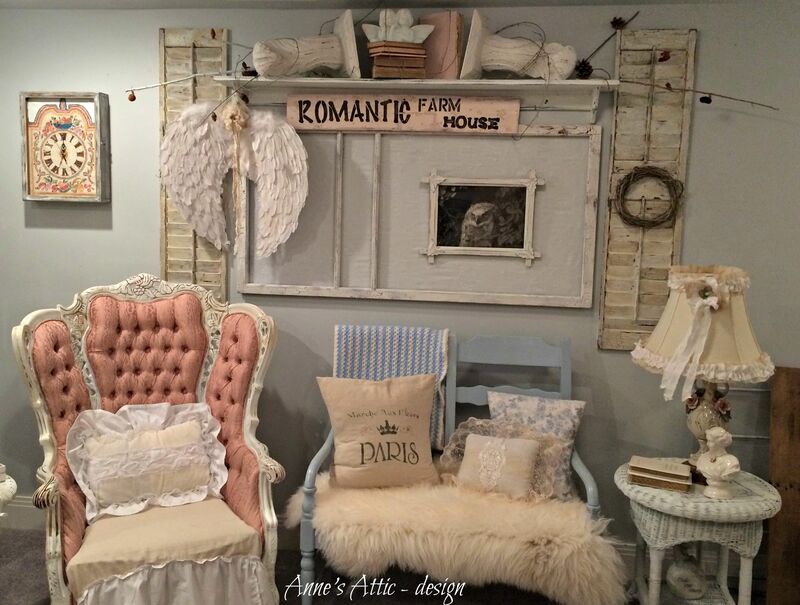 I love the use of the wall brackets to ‘frame’ your books and angels-very clever! Everything looks just lovely. I love how the shutters turned out. I too like to decorate with shutters and the chippier and more weathered the better 🙂 Wishing you a wonderful weekend. Wow, wow, wow! I love the patina you created on the shutters, absolutely fantastic! And your wall pure gorgeous. I know you must truly be happy with it all. I know I would be beaming ear to ear! I love the wings too, and the sign and how you have everything arranged. Love it, love it, love it all! As to your question, no I don’t have an online shop at the moment as everything is going toward my booth. I can’t get over how amazingly you were able to distress those shutters. Is there to be a tutorial?? I hope!! Your shutters look fabulous, Jo!! I love how they turned out. You have such a charming and inviting home with all of your special touches. So beautiful Jo. You know how I love a great shutter or two. You made these two look awesome. Great job. Have a great week end. 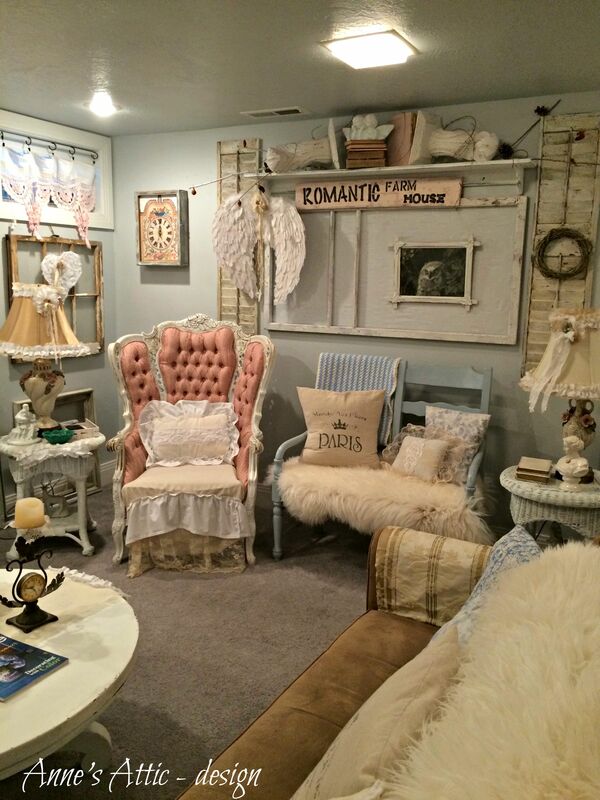 Everything you do looks like it belongs in a snazzy boutique Jo! What a fabulous job you did. Love the colors and that patina…oh my! Looking forward to the tutorial. I am always blown away by all the little details in your space. I know you don’t have much room, but it seems as though you have a big ol’ country farmhouse all to yourself. You should think about a new career as an interior designer! No I didn’t know you were an Interior Designer – obviously the exact right career for you!! Your shutters are sooooo wonderful……your home is so beautiful!!!! Beautiful job on the shutters! You are quite talented!!! 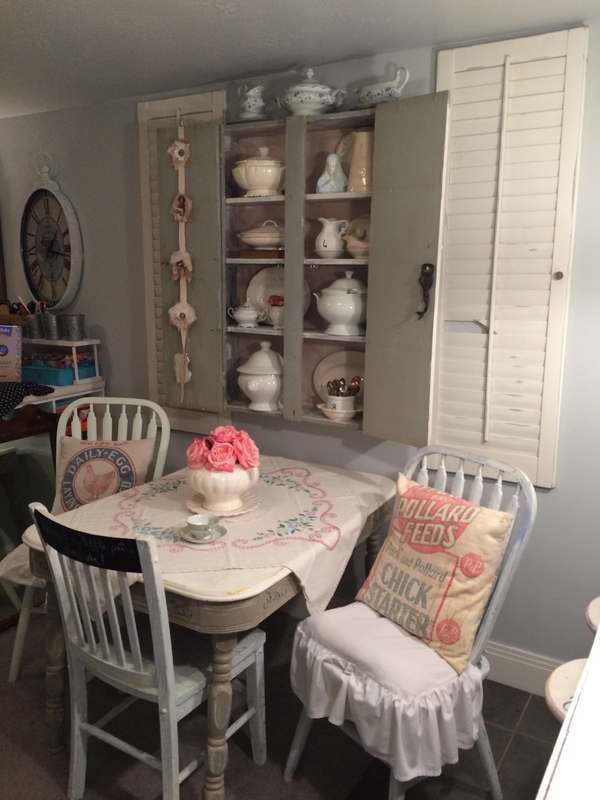 I love your chippy patina shutters…and have created such a beautiful cosy space. I sometimes I have trouble with vignettes, and that’s OK, but I figure I will get it right after a while…just need to let it sit for a while! I love how you used those shutters! I like the look of using them in unique ways. All of the vintage accessories look great combined together. Perfect chippy finish on those shutters! 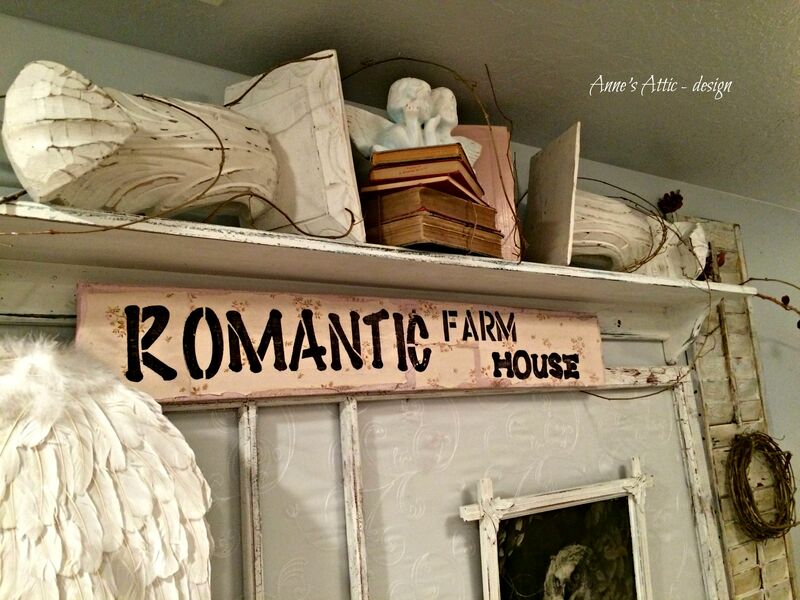 It all looks perfectly romantic farmhouse! Hi, I popped over from the blog party and am so glad. These are gorgeous. Thanks for sharing!!! I love both sets of shutters, the wreath looks great on the first set and they frame your area nicely! I see these all the time at the thrift store but I wasn’t sure what to do with them. Thanks! You sure did a great job displaying your shutters. Love the worn and chippy look!! Thanks so much for sharing them at VIParty. 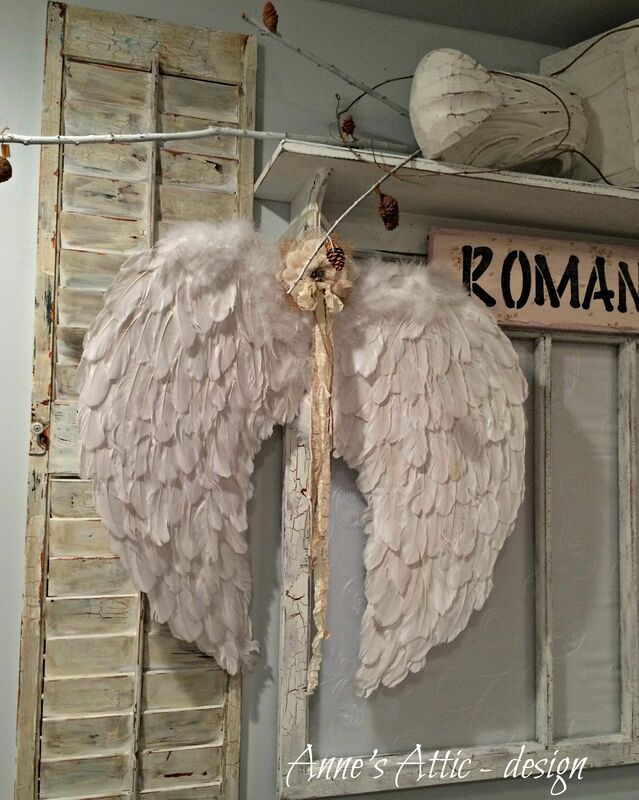 I love the shutters, but the angel wings are divine!! Thanks for sharing at Home Sweet Home! Those shutters look really old and straight from a farm..:) you did a good job. I love your sign, too. I’m going to link up to follow you. oops…didn’t see a Google Friends Connect and my inbox is filled to the brim with FOLLOWING BY EMAIL. Stopping over from a link party-and I’m so glad I did! Your home is absolutely GORGEOUS! I too would LOVE to know how you got the chippy look on your shutters! I’m your newest follower!! 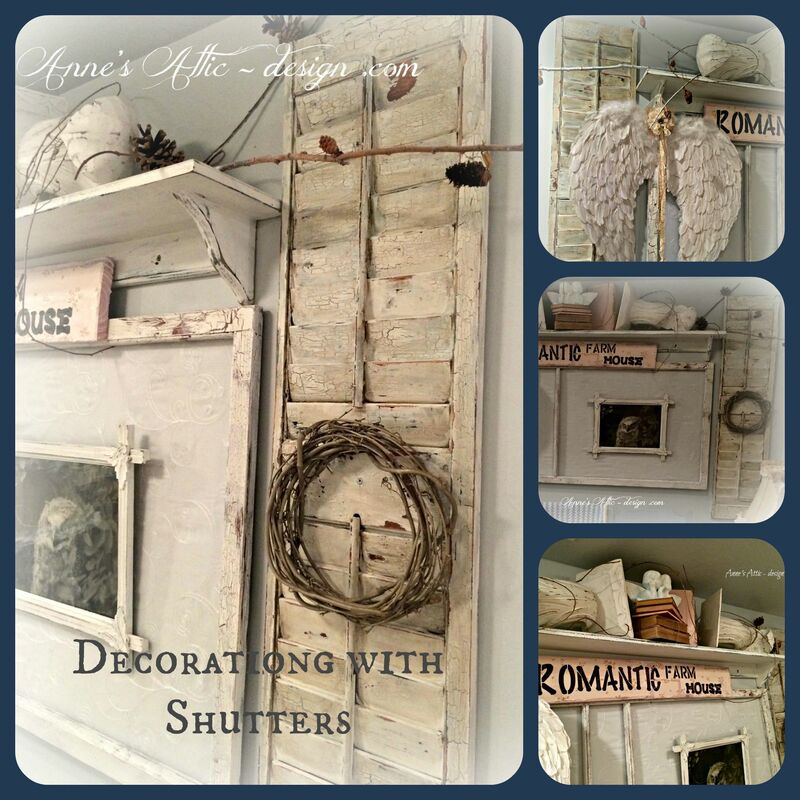 The shutters turned out fabulous, Anne! In fact, each photo was more amazing than the last. You are so amazing, Jo 🙂 Every little thing you touch becomes something beautiful. Thanks for sharing with Roses of Inspiration. Hugs to you! 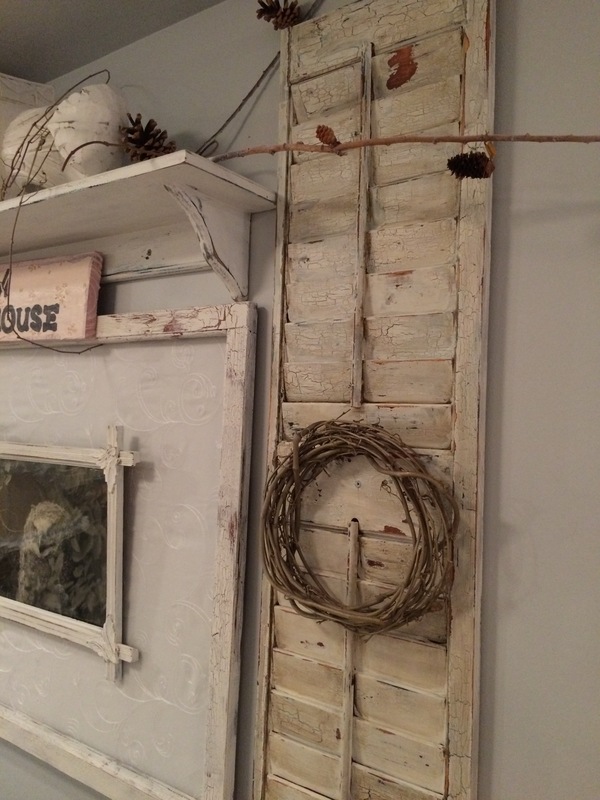 Jo, I love old shutters! I have been wanting a tall pair for a while. Actually had to pass up a pair twice. Wasn’t able to get them home. I love the crackle! Use to use that a lot, but haven’t used it for a while. Everything looks just gorgeous, as always! You have such a knack girl! Thanks for sharing with SYC. You can never ever have too many shutters imo! Beautiful! !